These are options that apply only to the horizontal and vertical bar charts. Intervals: The number of interval guide lines drawn on the chart itself to allow easier reading of item values. Minimum Bar Thickness: The minimum thickness, in pixels, a bar is allowed to have. If the bar the is thinner than this value, it will set to it, and the overall chart area will be increased to compensate. 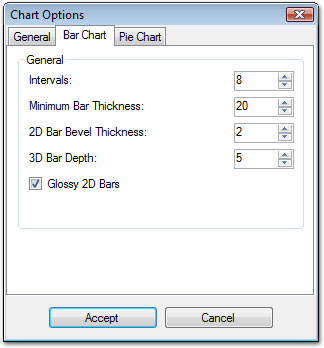 2D Bar Bevel Thickness: The thickness, in pixels, of the bevel used for 2D bars. The larger the value, the more bulging they appear to be. 3D Bar Depth: The depth, in pixels, of the 3D bars. The larger the value, the thicker they appear to be. Glossy 2D Bars: If checked, 2D bars will be drawn with glossy appearance. If unchecked, they will only be bevelled.